One of my favorite miracles from the New Testament is the story of the loaves and fishes where Christ turns 5 loaves of bread and 5 fishes into a passel of food to feed the weary and hungry multitude following him. 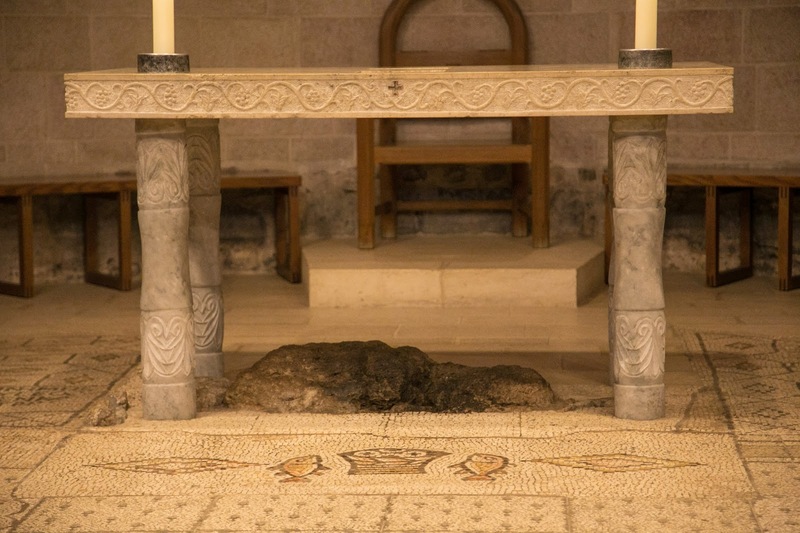 In Capernaum there is a church, The Church of Heptapegon or The Seven Springs that venerates a large rock (under the alter) believed to be where Christ laid the bread and fish to perform His miracle. 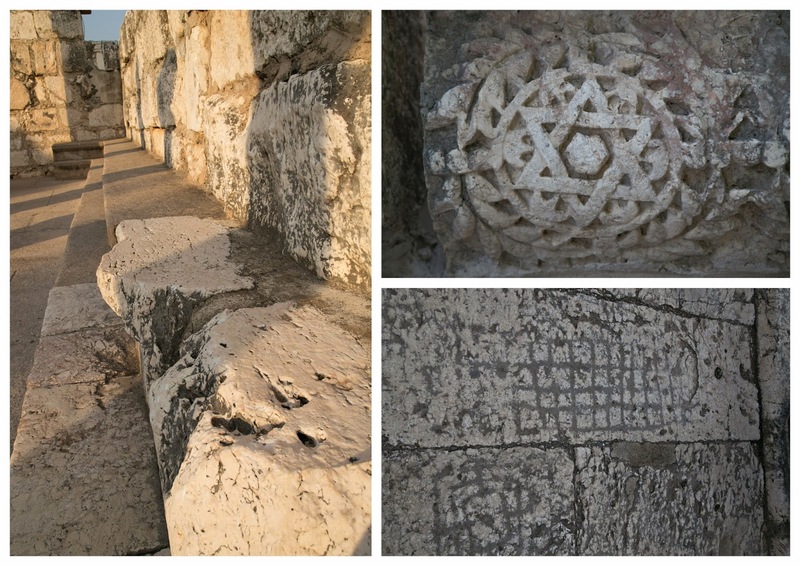 The first church commemorating this site was built in 350AD by a wealthy Jewish convert named Joseph of Tiberius. In 480AD a larger Byzantine church was built--the mosaic floors you see today are from this period. After the Persian invasion around 613 AD the church lay in ruin and was forgotten to history for 1300 years. In 1932 when excavations in the area began the church was found and the floors were in remarkably good condition. Today the church is maintained by German Benedictine Monks. 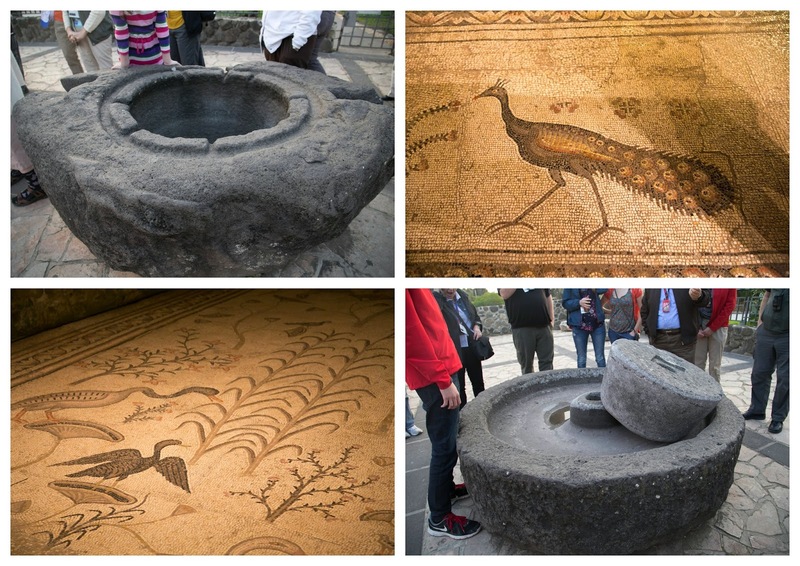 Not far from the Heptapegon is the ancient city of Capernaum, traditional home of St. Peter. There is even a ruin identified as his home, but it is speculative at best. 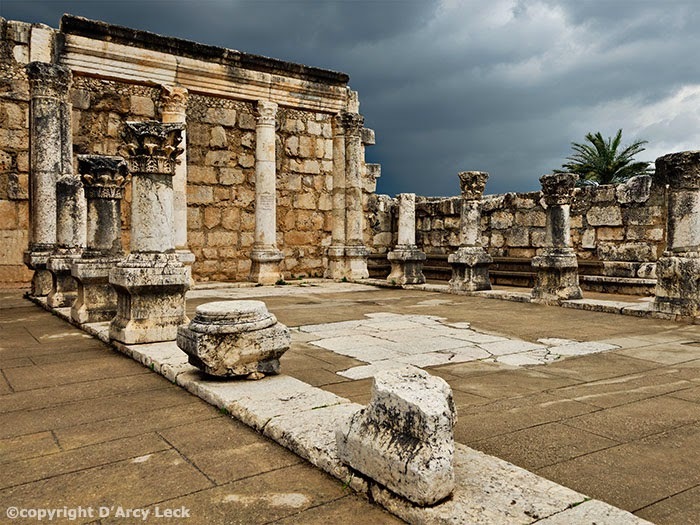 As is the case all over the holy land, a church (or two) has been built over a house that was identified as the ruins of Peter's home. On top of that, a modern Catholic church in the shape of a fish has been built. I am not going to lie, it is pretty lame--it completely obstructs the view of the ruin and somewhat ruins the atmosphere. n my collage of photos you can see a close up of the bench the men would have sat upon--it was normal for the bima or alter containing the torah to be in the center of the room with benches on either side. When a rabbi was ready to teach he would sit down--that was his signal to the crowd to listen up. 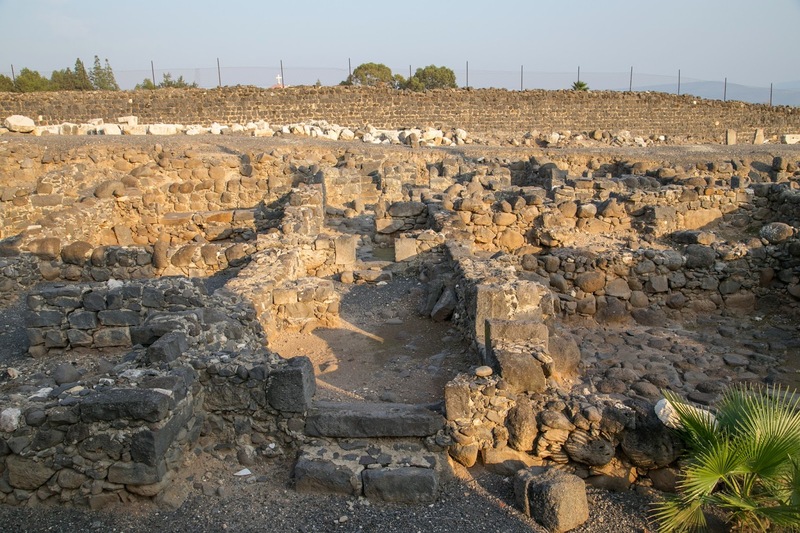 Capernaum was a small fishing village, not a wealthy town, as evidenced by the ruins of densely packed homes. 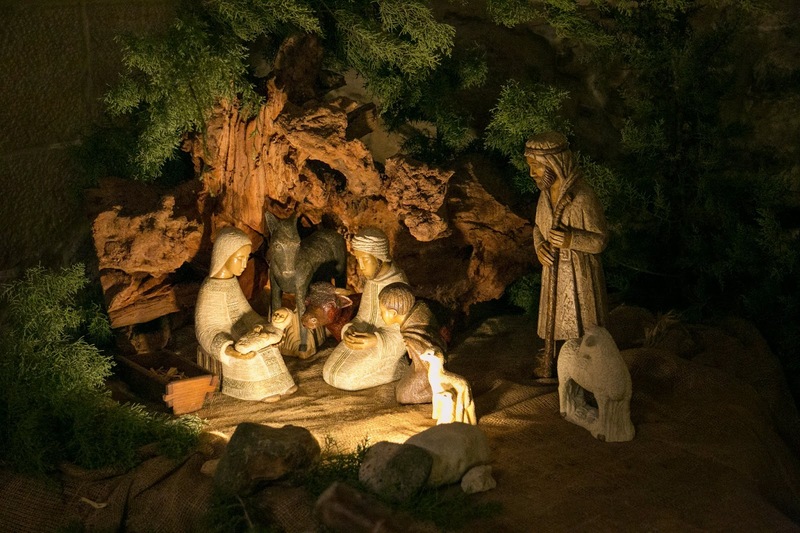 Many shared walls, had few windows and roofs made of straw that could be pulled back--which is how they could have lowered the sick man from the roof into the crowded room where Christ was. Above: View of a Byzantine church built over the house that is believed to be Peter's. 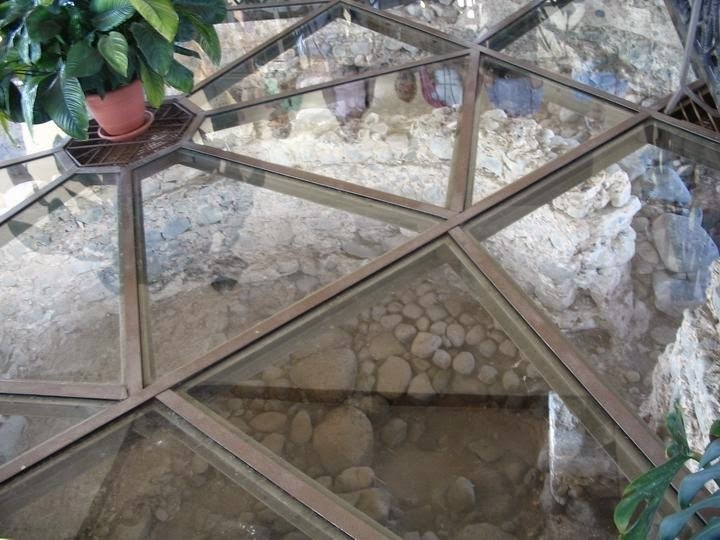 Below: Inside modern church there is a glass floor allowing you a view inside the ruin of Peter's house. 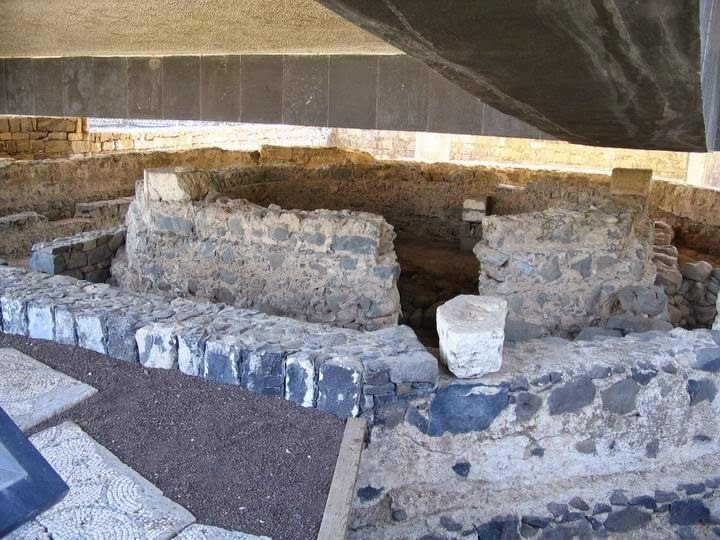 Capernaum features prominently in the life of Christ and the New Testament. 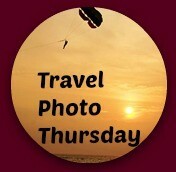 I will be sharing a few more personal things we learned while in the area on my family blog. Thanks for this unusual and informative post. Capernaum is not a place I have heard of before. I've never heard of Capernaum either. Interesting to learn about it.